Diaz and Fallon made poses from "Charlie's Angels" and "Lady and the Tramp" in the background of the pictures, unbeknownst to the visitors. 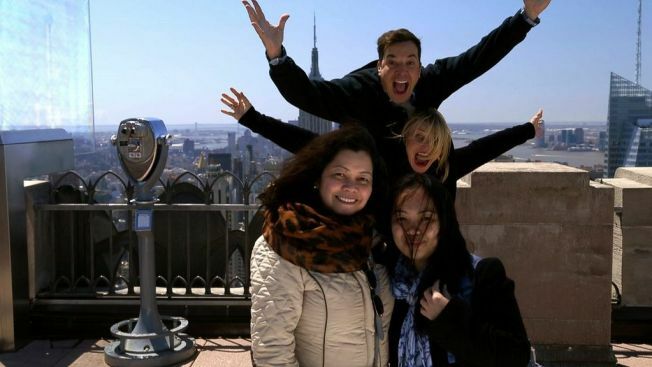 On Wednesday night's episode of "The Tonight Show," host Jimmy Fallon and Cameron Diaz photobombed unsuspecting tourists at the Top of the Rock, home of the observation deck at Rockefeller Center in New York. Tourists were asked if they wanted to have their photo taken with a point-and-click camera for the "Top of the Rock" website. What they didn't know was that Diaz and Fallon were waiting for them to begin taking the photo so they could sneak in and photobomb the picture. Fallon pulled the same stunt with "Mad Men" star John Hamm. Watch the two photobomb pictures above.